Fresh from his Couture show in Paris at Palais de la Découverte, designer Georges Chakra has done it again. He has used luxurious fabrics in beautiful colors to create sweet yet modern silhouettes with extraordinary detail. The result is a très chic, Parisian inspired collection of fun dresses, stunning evening suits & enchanting gowns. Georges Chakra has been featured in WWD, InStyle, Elle & has dressed the likes of Jennifer Lopez, Katy Perry, Emily Blunt, Carrie Underwood, Katie Cassidy, Kelly Rowland, & Dania Ramirez to name just a few. His EDITION collection can be found in retail stores across the world including select Saks Fifth Avenue stores and Wynn Las Vegas in the United States as well as Harrod’s in London and Harvey Nicholas in Dubai & Istanbul. When Sam Bisbee and his five-­piece band opened the Nanette Lepore Spring 2012 show with a fun, energetic beat, you could feel something delightful was going to come down the runway. As the first look came down the runway, it is clear that color blocking is here to stay and the colors are getting brighter and brighter. A citrine crop top and tangerine skirt began the show. Each look was completed with a contrasting wedge or platform heel. The collection had a sophisticated youthful feel with cut outs, crops, color blocking with longer hemlines and tailored jackets mixed in. The silhouettes were kept simple. She favored full skirts and shorts, although there was a series of slim-fit dresses and pants. As the show progressed floral prints were mixed in as well as under lays of color and striped looks. The swimwear kept with the same youthful feel but with a retro cut and design, again using the fun, flirty floral prints. The colors, the prints and the silhouettes combined with the fun, energetic live band left you desiring spring and sunshine immediately! I’m loving backstage. While it is crazy, hectic and even a bit mind-blowing at times, there’s nothing like it. 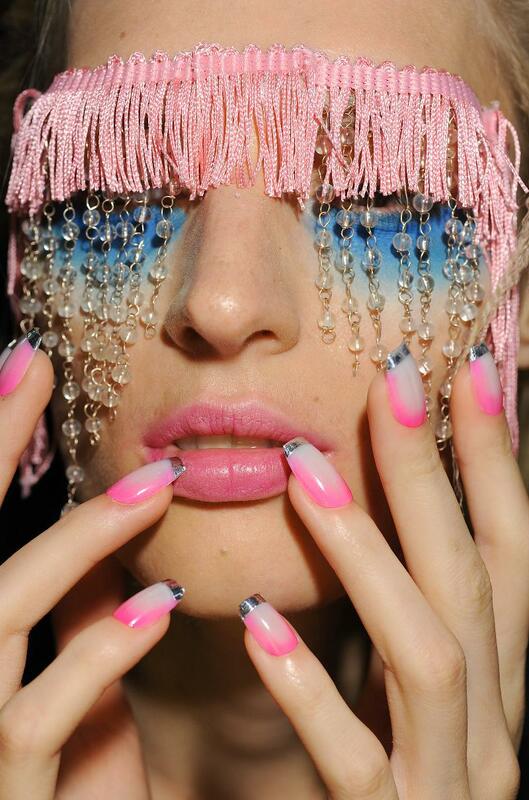 This season’s hair, make-up and nails, especially nails are WOW. Yesterday’s shows are no exception. A perfect manicure has long been one of beauty’s most important staples. However, due to budget and timing, it may be difficult to keep up with this trend. A cost-effective, stylish option that has gained popularity throughout the celebrity community is nail art – stones, stickers, and the old classic, the French manicured tip. But how do you make those styles last if you’re on a budget or don’t have the time to keep up a frequent routine? Here, Creative Director of Pretty Woman, Aija Vilemsonne, shares some advice for making your trendy manicure last. “One of the most important things that you can do to prolong your manicure is to make sure that your nails are in good shape,” says Aija. “Without a healthy base, chipping and breaking occur more often.” Below are some valuable tips for taking care of your nails to maximize your manicure. To maintain the look you want and prevent breakage and hangnails, it’s important to file and trim regularly. Your only tools in this attempt should be sharp manicure scissors and/or clippers and a fresh emery board. We don’t typically think of our nails as requiring moisture, but like any other skin on our body, nails are sensitive and subject to drying. It is especially necessary to do this when you remove polish from your nail bed. Applying a thin coat of polish keeps moisture in your nails. If your nails are subject to breakage, use a nail strengthener or hardener to treat nails while sporting your new look. Apply nail polish and allow ample time to dry. Remove sticker from the product sheet and slowly place it on completely dried polish, taking care to position correctly. Push sticker down from the middle funneling outward, ensuring no ridges or creases. Apply a top coat of polish to protect sticker from chipping and maintain a lasting, glossy finish. Paint nails, and before the polish dries, add the stones in the desired spots. Aija suggests placing the product closer to the middle of the nail so that the chance for chipping or loss is minimized. Allow time to dry, making sure that the stones stay in place. Apply a top coat to seal the look and to increase the longevity of your manicure. For this style, you can turn to a nail care tip guide, such as Pretty Woman’s version, available at Rite Aids nationwide. This ensures a more polished finish, and is great for those of us who aren’t as skilled in the nail department. Apply the guide over clean and dry nails, and the white accent liner over the nail tip. 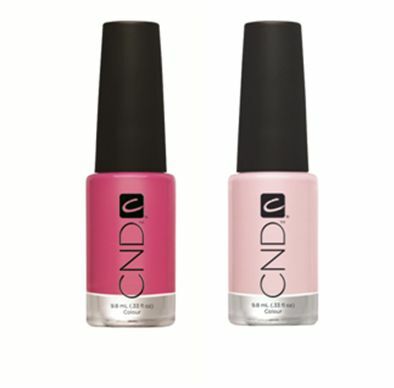 Paint your nails the desired color, and allow time for complete drying. Carefully remove the tip guide, and apply a top coat to prevent chipping and increase shine. Rowenta is turning up the heat as it enters its fifth season as official garment care sponsor of Mercedes-Benz Fashion Week at Lincoln Center in New York. They will offer event attendees the opportunity to engage with the brand and experience Mercedes-Benz Fashion Week as never before. This is a very good thing and I’m sure welcomed. If you’re not attending NYC Fashion Week, then join Rowenta’s Facebook and Twitter communities for the opportunity to win tickets to a Fashion Week show or win an exclusive Mercedes-Benz Fashion Week Pro Master iron. Become a Rowenta fan on Facebook or follow the brand on Twitter for added instructions. Let me say that this is a great product to put on your wedding registry!! On Fri., Sept. 9, attendees will be able to create stylish t-shirts and tote bags using the exclusive Mercedes-Benz Fashion Week Pro Master iron and fashion designer and Rowenta style ambassador Althea Harper’s custom iron-on designs at the Rowenta iron-on pop-up station in the event Lobby in Lincoln Center. All week, attendees will be able to work the Rowenta Runway in the Rowenta photo booth at Lincoln Center. Attendees can also enter to win an exclusive Mercedes-Benz Fashion Week Pro Master iron. Four winners will be chosen daily.